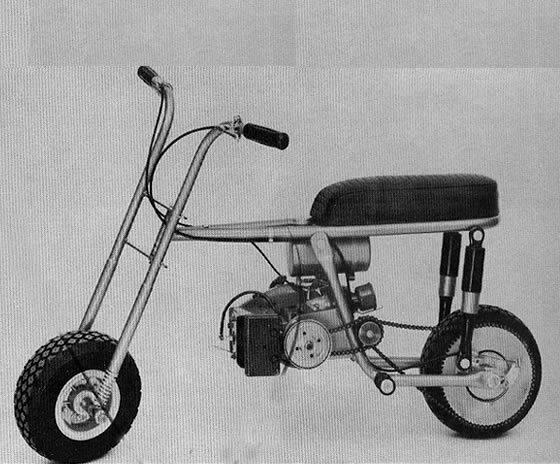 In the 1965 catalog #5 STEEN’S Series I is now two models. Sales are so good and with no real competition yet that Steen introduces the Series II three new models powered by the Briggs and Stratton 4 cycle 3HP and 2HP engine. Equipment & dimension are the same as the ‚ . 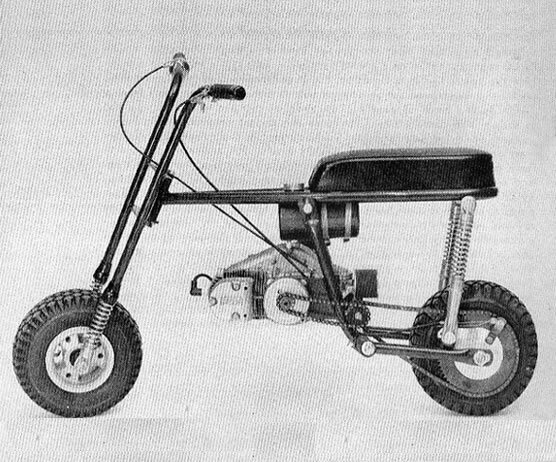 You assemble it Mini-bike kit. Frame and forks are pre-welded. You weld only the motor mount in position to fit your engine. It includes:tires with tubes, 5’ wheels, 70 tooth sprocket, twist throttle, brake device, seat and all components to build the bike EXCEPT engine, clutch and chain. In the 1966 catalog #6 the models pretty much stay the same. The only chances were the model name is drop and is now called the model and the model name is also drop and is now called the . The powered by the West Bend 820 model is now discontinued. The Azusa 5” Hands S look alike alloy rims are discontinued and the Steen's 5” alloy rims are introduce. Equipment & dimension are the same as the previous catalog. 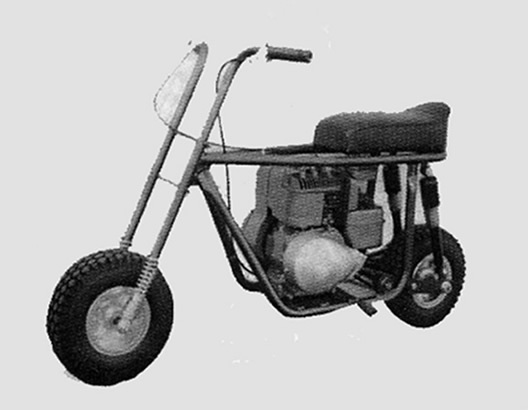 In the 1967 catalog #7 the 2 stroke model is discontinued and replaced by the 2stroke model. 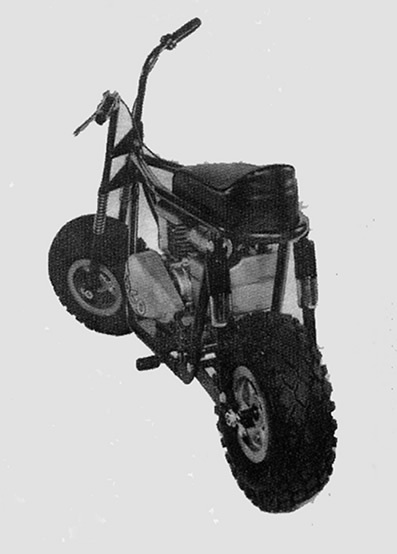 The frame design is a cradle loop lower frame with swing arm rear suspension. This will be the last year for the 2 stroke models. This new frame also will be used for the new . The will also be discontinued. Standard equipment stays the same. 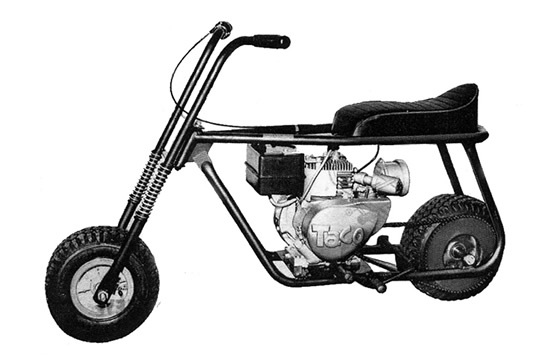 In the 1968 catalog #8 the is now discontinued and the new with the Briggs & Stratton Hp5 is introduced. The tub swing arms on the are redesign to a cut out 1/8” flat piece of metal. In 1969 catalog #9 the Frijole Series I frame is now discontinued and the new Frijole Series II frame is introduced. no other chances.